First, the cabinets are oak wood frames and doors. The interiors were white so I didn't paint the insides. Just the frames and door (anywhere you could see the oak). Before you do anything you want to lay out a plan. 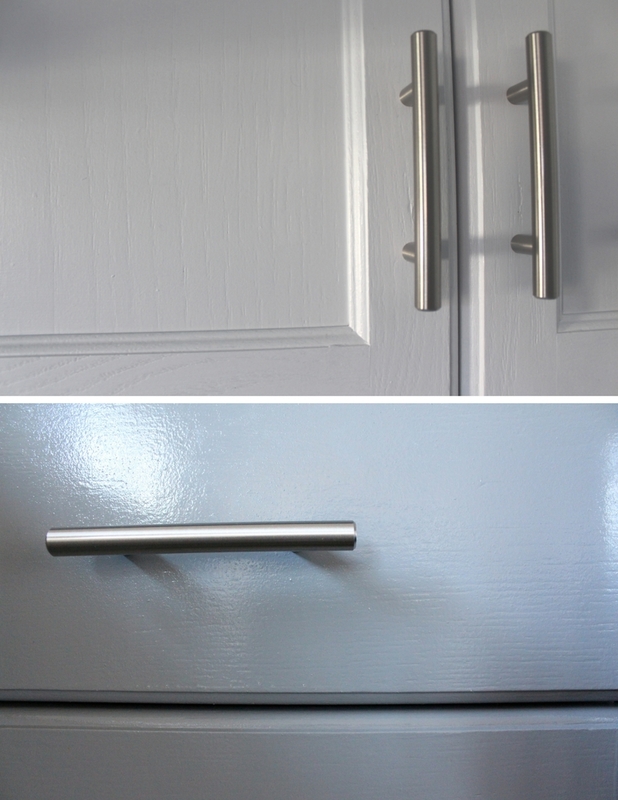 I painted my cabinets two different shades; light uppers and dark lowers. Therefore, I numbered the lower cabinets and used the alphabet for the uppers with painters tape. I also drew an outline just in case the stickers were to come off. Use a sticker system (I just used painters tape) and number the frame and doors. Remove the door handles. I purchased new handles and kept the same size so no new holes were needed to be drilled. Remove the cabinet door. I left the hinges attached to the frames. Keep all screws in a zip lock bag for later use. De-grease/wash all doors and frames. Using the TSP solution with gloves and a scrub I washed all the doors and frames. This step is crucial in achieving a long lasting and smooth finish. 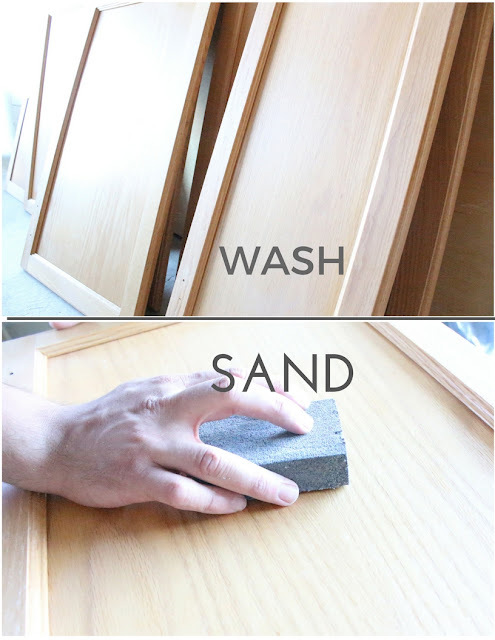 Using a fine sanding block: sand lightly the doors and pay attention around the handle area (as that's where most grime and finger oils dirty the wood). Vacuum and dust using your vacuum's furniture nozzle attachment. Using a tack cloth go over everything to make sure no dust left over. Layout all your doors front side down (paint the backsides first). I placed all my doors on dixie cups so they wouldn't lay flat on the floor. Use a thin coat of primer and prime all the doors and frames. Start first with a brush and paint the edges and crevices (arrows in picture). Paint the insides and any flat areas. You can either use a brush or foam roller for this step. Let dry! You can sand again between steps but I just primed a second coat without sanding. The fun part! By this point you might start thinking, "what was I thinking?". The primer is not going to look like the finished product; it's not suppose to look perfect. Once the primer is completely dry you can paint everything in the same order you primed. Paint the backsides of the doors first!! I did two coats. However, for the lowers I ended up doing three coats because the first shade I picked didn't dry to the shade I wanted. Hence, why I didn't use the same brand of paint for uppers and lowers. TAKE NOTE: you use a brush for the edges and crevices. You use a foam roller for the flat areas! *if I had to pick between Sherwin Williams and CIL paint: I will admit I liked the CIL paint slightly more as I felt it was a"milkier" finish and went on smooth. However, I find that the Sherwin Williams paint is holding up better than the CIL. 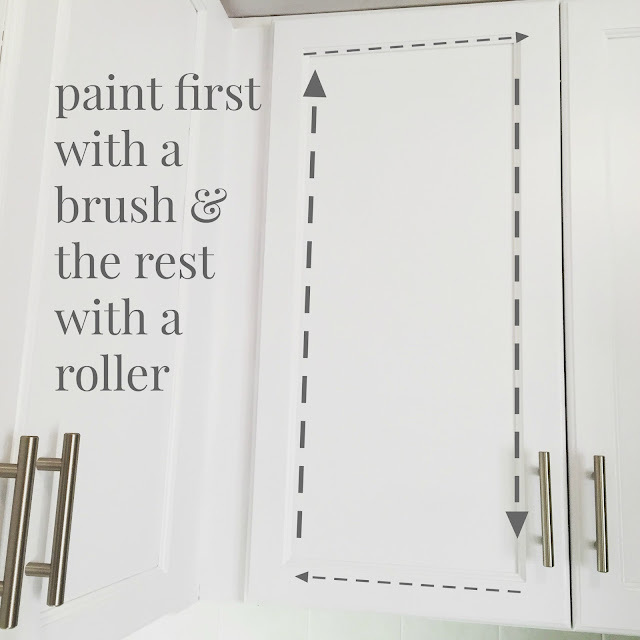 Adding a top coat will smooth out the paint even more. Also, since this is a high traffic area that will be cleaned frequently adds a better coating. If you see in the picture (above), there's a sightlier glossier finish to the lowers as I added a top coat to the lowers only. When I tested out the top coat on the uppers it left a yellowish tint to the paint. Which I had read happens sometimes when you add a top coat to white paint. My top coat of choice is: MINWAX Polycrylic top coat in satin finish. If you notice in the above picture they're also shinier than the uppers. Imagine if I had used a gloss finish...unless that's the finish you want. Once everything is completely dry! 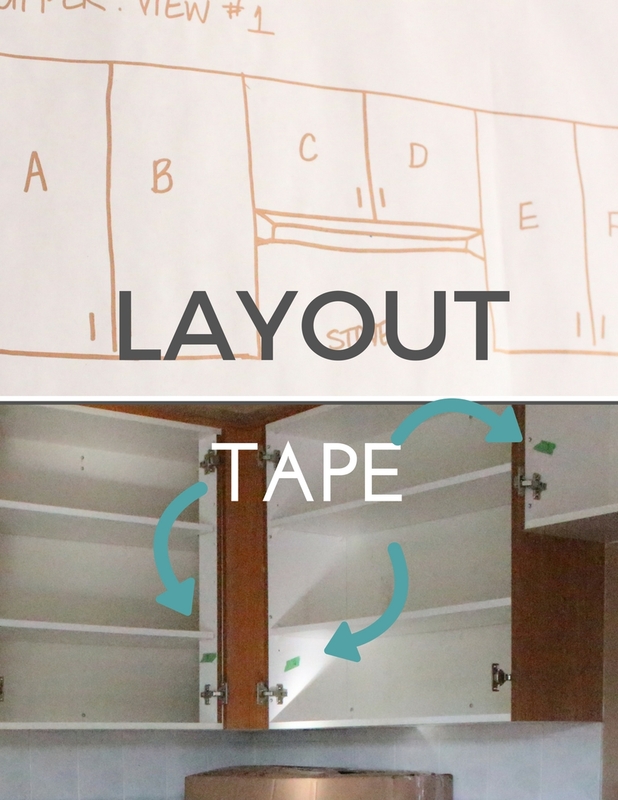 Attach the cabinet doors to the frames and add the handles. Viola!! You're finished!! Remember to allow it to dry (I gave it about three days) the paint will still take a few days-weeks to completely cure. So, be gentle with your kitchen in the first couple of weeks. Lastly, the countertops were professionally painted by Countertop Makeovers. 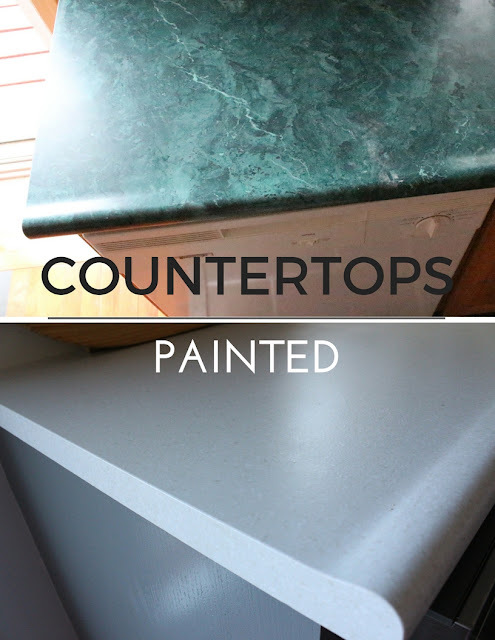 Jennifer, from Countertop Makeovers came over for an estimate and paint colours were chosen. 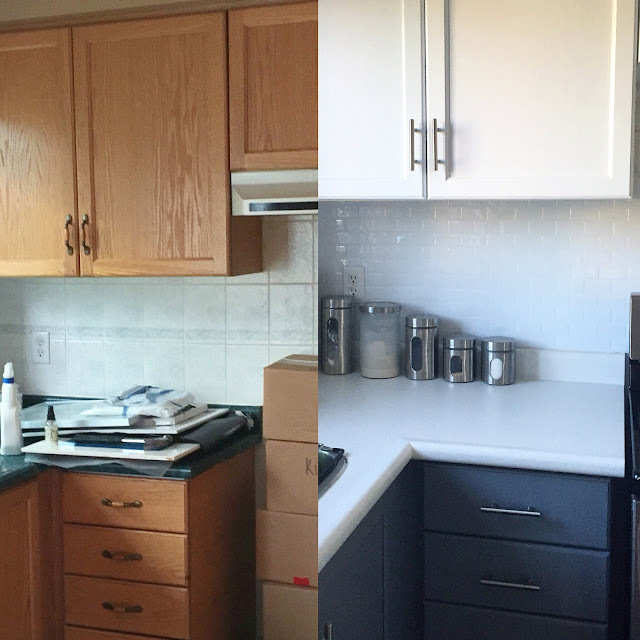 She painted the countertops within a day. Take note, that I don't use my countertops as a cutting board. The finish is so good that most guests would never know they were painted if I didn't tell them. For me this kitchen wouldn't be complete without the painted countertops. If you want to attempt doing this job yourself, countertop transformation kits can be purchased from the hardware store. Hopefully, I covered everything. For any further questions, leave a question in the comment section.